Design a cozy kitchen easily in your own style with automatic software. Get started as quick as lightning from predefined shapes or templates. A cozy kitchen is the place to feast your family's appetite and offer them enough energy. Particularly for women, a dreamy kitchen will help them enjoy every time of cooking. Simply bear in mind that you just is your own kitchen designer aided by proper tool. Actually, you can design it yourself and make it like no other in your own style, quite easily, even without any design skill or experience. Just rely on Edraw - automatic kitchen design software. 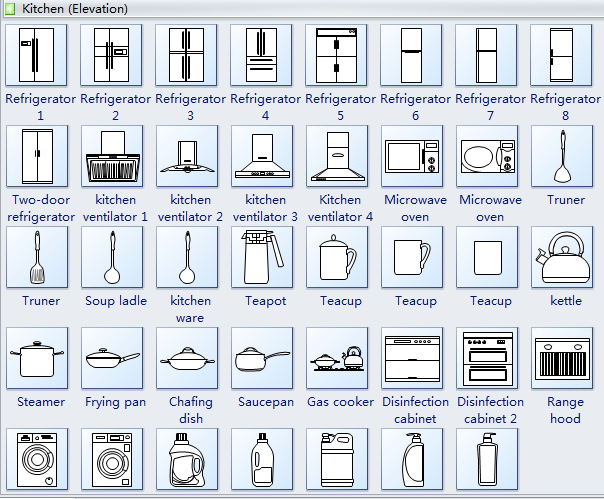 Edraw includes lots of kitchen symbols to meet users' different drawing requirements. In Edraw library, you can easily use kitchen elevation symbols to depict frame, divider, drawer, basket, suitcase, lattice, etc. Go to Elevation Diagram Symbols page to have a general knowledge about the symbols. Check out kitchen layout tool or kitchen floor planner here. Download free printable kitchen layout templates here. 1. On the File menu, point to New, select Floor Plans, and double click Kitchen Elevation template. A new drawing page will open with gridlines on it for accurate design. A series of shapes libraries also open on the left. 2. Go to the library pane on the left of the canvas. From Kitchen (Elevations), drag shapes you need to the canvas. 3. Use Dimensioning; Wall, Shell and Structure shapes to display the layout of the kitchen. Print: When a kitchen elevation is done, it's easy to print and share with more people. On the file menu, point to Print to set for print options. You can change settings with fewer clicks and see the print preview in real time. 1. Do it your way and borrow the ideas you like best from professional kitchens. When you come across problems, take hints from professional kitchens. 2. Less equipment and more empty space. Minimize equipment and move equipment that are not frequently used outside the kitchen. If space is limited, consider under-counter refrigeration and smaller dishwashers. 3. Design doesn't only mean walls, furniture and appliances. Having fresh plants on the counter and listening to music that gets your hips swinging are as much a part of the beauty of your kitchen as anything. 4. Don't be held back by a small budget. The high quality is more important. In a long run, durable materials can actually save money. 5. Add some personal touches. Little things can also warm a space. For example, a piece of wallpaper make your wall be able to tell. Note: to search a certain shape, you can use the search box above the libraries. 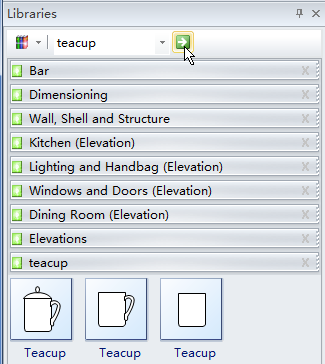 Enter the shape name such as "teacup", press the green arrow on the right to begin searching. Then all teacup shapes will be presented in the library pane. Just choose a suitable one and drag it to the desired location. The completion of construction is not the end of the journey. Preserving the wonder of your kitchen needs constant maintenance and maintenance. And, to keep up its worth, updating is additionally usually needed. The kitchen is really the center and soul of any home. With a spotlight on updating the aesthetics and functionality of a kitchen, a home-owner will add important worth to their investment. See the Kitchen Elevation Example Drawn via Edraw Here.